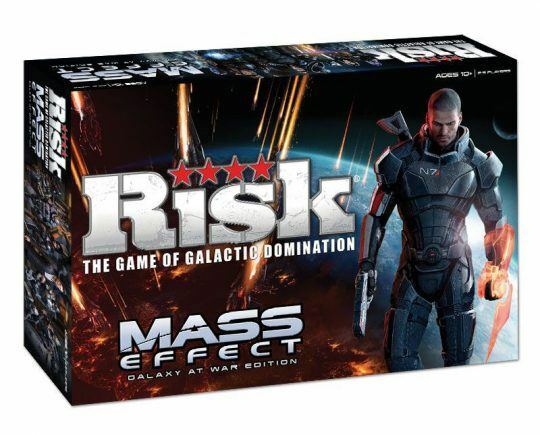 A Risk re-implementation based on the popular Mass Effect series of video games. Galaxy at War – fast-paced and strategic, individual and team play. War Assets – quick card and dice game play. Game comes complete with over 250 game pieces. Custom components include 2 Alliance Armies, 2 Reaper Armies, 1 Cerberus Army, 2 Harbinger pieces. 81 Faction Cards representing the 3 factions, 18 War Assets planet scanning cards (which can also be played as a standalone mini-game), Custom game board, 5 six-sided dice and 4 eight-sided dice.